Share the post "Breakfast on the Run"
Sometimes Sunday morning can be a bit more hectic than regular week day mornings. What I especially appreciate about early Sunday morning is the lack of traffic on the highways as well as downtown. The character of the drive downtown is different in that one doesn’t have to be watching the traffic as closely which gives a more leisure feel to the journey. Nature seems to be more visible on Sunday mornings as well. I could see the trees just beginning their journey towards winter dormancy with some of their leaves beginning to turn from a solid green to a more yellow shade. I had to drive up to Plymouth early and place four open house signs starting at Highway 65 and then three corners in town. There wasn’t a car to be seen at that hour which made it easier to get the signs placed. When I was coming back, the thought crossed my mind to take a detour and drive to Rock Falls and see if I could get a good photo of the Shell Rock river from the bridge. The drive there as equally delightful as I watched the beef cattle grazing in one pasture and another herd of dairy cows grazing in the distance. I parked near the bridge and took a few photos viewing upstream and as I was walking away I thought I’d at least see what was going on downstream. 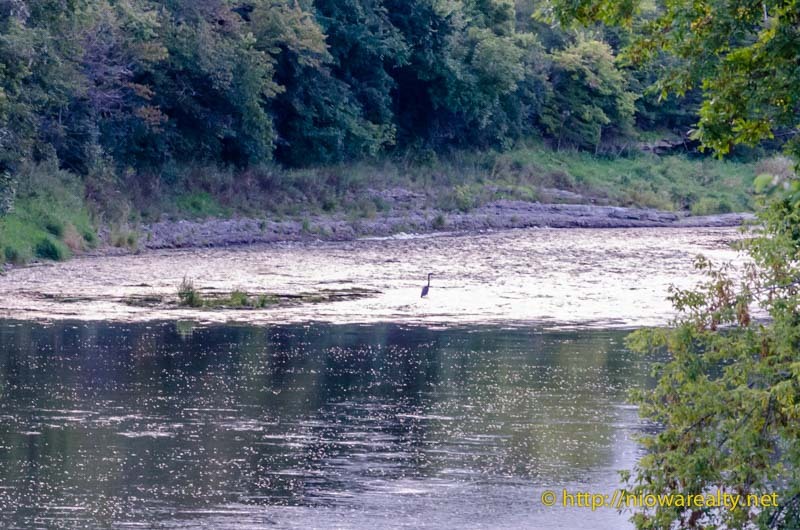 To my surprise, there was a Blue Heron standing in the middle of the river, likely on a high point, waiting for fish as they swam downstream. I took a photo of it but it isn’t the clearest. I think they are very graceful when flying as well as walking. I’m glad we are finding more of them in the area. I’m sure the naturalists are happy with the progress they are making in bringing back animals that were native to our prairies in generations past. Upon my return to Mason City I thought I’d better stop and grab something light for breakfast as I hadn’t yet had anything to eat. I stopped at a convenience store and grabbed a cream cheese croissant and headed back to the office. While driving down Birch Drive I noticed something moving in the distance. 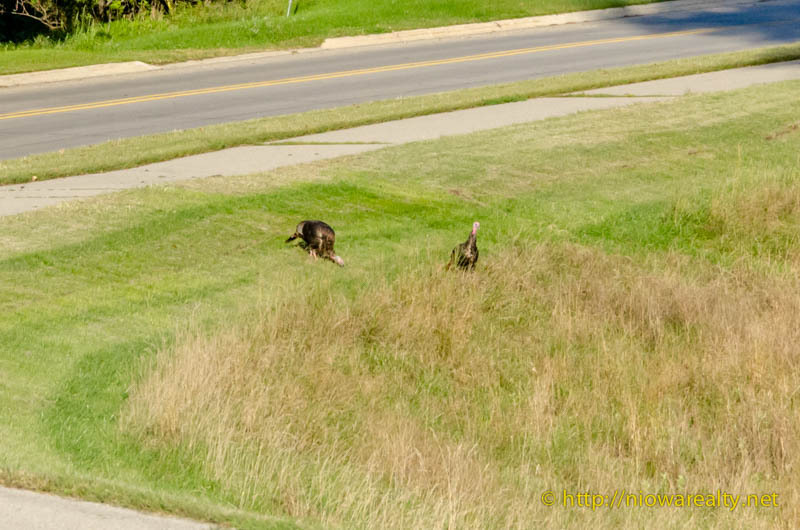 After getting a closer look I could see there were two wild turkeys grazing along the street. I stopped at a distance for fear of scaring them off and was able to get an acceptable shot of them before they ran back into the treed area. They are yet another wild bird that I had never seen until just these past ten years. They certainly are beautiful birds and much larger than you’d think until you see one up close. I guess we were all having breakfast on the run this beautifully quiet Sunday morning.